Hi! I'm Stella Grace, and my peeps call me Stella! 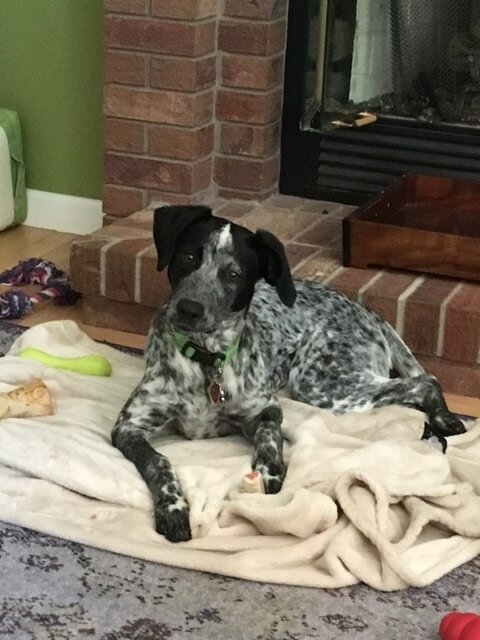 I'm a German Shorthair Pointer/Red Heeler mix, and that makes me extra beautiful and special! They say I have lovely "blue tick" markings, and they even have my birthdate -- November 15, 2015! That makes me about a year and a half old. My sister and I are trying to live in the same foster household, but you know how it is -- sometimes sisters have a hard time getting along even though deep down we love each other. So my awesome people are looking for some awesome new people to love me (and for me to love them!). They say I'll do great in a one-dog household, and that's fine with me, too. They even think I'd love living on a ranch or farm, or with a bigger dog I can look up to. My ideal forever home would be one where I get lots of exercise and can run around a lot. I'm not a fan of kennels even though I know how to stay in them -- it's just that there's so much to explore out there! I'm spayed and all my doggie shots are up to date, including leptospirosis and bordetella. For more info about me, contact Brenda Ogden at 970-491-7200 and/or 970-227-0073.